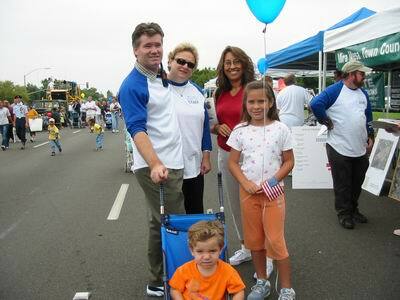 VOY 2000 Volunteer of the year for 2000 Keith Flitner with his family and 2002 Volunteer of the year Karen Burger at the 2003 Mira Mesa Street Fair. 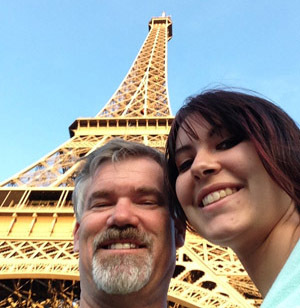 Keith Flitner started volunteering in 1995 after his first child, Jacqui, was born and he decided to learn more about Mira Mesa. He first joined and later chaired the Mira Mesa Landscape and Community Pride committees which conducted various community clean-up events around Mira Mesa and the adjacent Natural Preserve. He ran for 1st Vp on the Mira Mesa Town Council and then moved up to President a year later. At about the same time, he was selected to serve on the Mira Mesa Community Planning Group during the time when the Mira Mesa Market Center was approved. He also volunteered to be on the local School Board Advisory committee helping craft Prop M to fund school modernizations in all of San Diego. Jacqui started school at Mason Elementary School where Keith became involved in the PTA and then became President helping the school modernization efforts. His family joined Mira Mesa Presbyterian Church where he was selected as an Elder and then the President helping pay off the original mortgage and making landscaping improvements. Keith also enjoyed being on the 4th of July committee for a few years including when the Halloween Haunted Mansion was started as a community fundraiser. One of his proudest accomplishments while living in Mira Mesa was starting the Mira Mesa Street Fair which is now an annual community event that grew out of the previous I Love Mira Mesa Day. 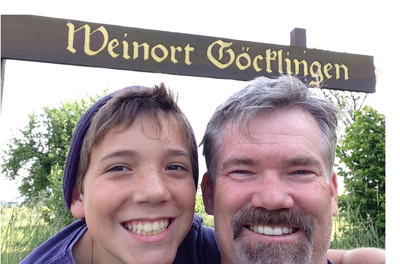 In 2003, shortly after the birth of his son, Stefan, he left Mira Mesa and relocated to Orange County for a new job where he is today, but he still keeps in touch with Mira Mesa.